There are few industries greener than the recreational Atlantic salmon fishery. Wild salmon require clean, cool rivers that flow freely to the sea. Healthy rivers require healthy forests and surrounding riparian corridors. And for the most part, catch and release angling for Atlantic salmon is regularly practiced, and in some cases strictly adhered to at places like Camp Bonaventure, Salmon Lodge and the many other camps participating in the Atlantic Salmon Federation’s (ASF) Live Release Club. Atlantic salmon angling and the considerable industry of outfitters, guides, lodges, travel agencies, tackle dealers, equipment manufacturers, and related service providers is big business, to the tune of $130 million annually in spending and the equivalent of more than 3300 full-time jobs, or more than 10,000 seasonal jobs in Quebec and Atlantic Canada. ASF recently commissioned a study by leading economists Gardner Pinfold of Halifax, Nova Scotia which examines all aspects of the value of wild Atlantic salmon. Any way you look at the numbers they’re impressive. But when you also consider the regions where the majority of the jobs are created and the spending occurs, places like Quebec’s Gaspé and North Shore, northern New Brunswick, Cape Breton Island, Newfoundland and Labrador, its doubly impressive. These are regions with high unemployment and where good jobs are scarce. Wild Atlantic salmon not only represent a cultural and environmental icon, but the foundation upon which communities and regions have built and sustain robust economies. And the best news is that there are significant opportunities to grow the industry further and create even more good jobs. ASF’s message is one of hope. Wild Atlantic salmon contribute so much to places like the Gaspé, Miramichi, Restigouche and Margaree valleys. Thanks to the good work of ASF and our network of conservation affiliates Atlantic salmon runs are slowly but steadily improving. More anglers are buying salmon license and going fishing. This is great news for anglers, outfitters and the many families and communities that depend upon a healthy salmon resource. But it’s also good news for the species itself. More anglers, outfitters, businesses and communities that care about wild salmon means more people participating in and investing in salmon conservation and the protection of our salmon rivers. 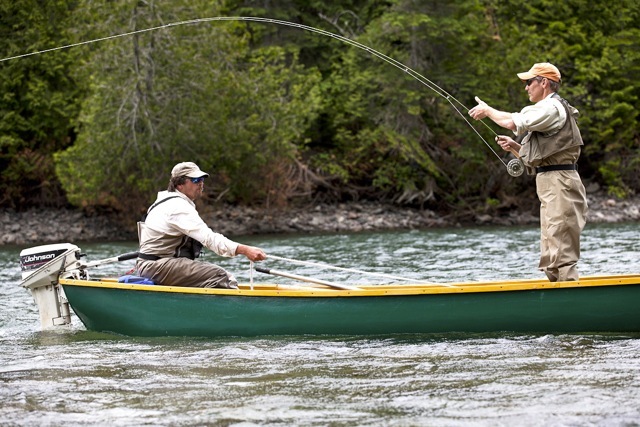 Bill Taylor and Salmon Lodge guide Pat Trudel "hook up" on the Bonaventure. The 2012 salmon angling season got off to a bit of a slow start with low water in many regions, including the Gaspé. When the rain finally came in late June so did the salmon and angling success improved dramatically. Scientists predicted good runs of salmon and grilse to much of Quebec and Atlantic Canada this year and so far it appears their predictions are on the mark. Some of this season’s best fishing, especially dry fly fishing, is still ahead of us. Best wishes for good fishing in the weeks ahead.